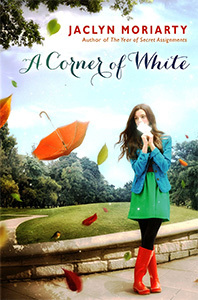 I’d enjoyed the previous books by Moriarty that I’d read, and had picked up the ebook for A Corner of White when it first came out after hearing good things, but (due to massive ebook backlog) only just got around to reading it. I wish I hadn’t waited so long! Why should you read it? For the well-balanced blend of quirky realism and quirky fantasy, for the emotional depth that rings through the quirkiness, and for the seemingly unconnected plot details that come together cleverly in an expertly crafted conclusion.